The book that more than 12 million YouTube subscribers have been waiting for! Shane Dawson's memoir features twenty original essays-uncensored yet surprisingly sweet. Shane Dawson has always been an open book. From his first YouTube vlog back in 2008, to his feature film debut "Not Cool," to a cover story in Variety magazine, Shane has documented his life pre-tty thoroughly. We've seen awkward and adorable Q&As with his mum, weight loss center drama, love life details, and the all-important haircut reveal. We've seen his hilarious spoofs of Miley Cyrus, Paris Hilton, and Sarah Palin. His music videos are awesome. 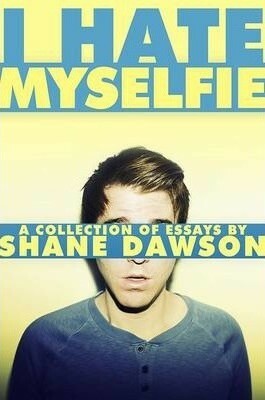 But in I Hate Myselfie, fans will finally get a chance to see the real Shane through personal stories that are at once humorous and heartwarming, self-deprecating and totally inspiring. Highlighting key moments of his childhood and adolescence, through his phenomenal success on YouTube, and continuing on to his more recent experiences as an actor and director, Shane's memoir will feature the silliness and satire his fans already enjoy, but it will be even more in depth, more real, and more portable (it's a book).